Characterized by a stately silhouette, the Hertz dining chair distinguishes itself from the rest with a curved and diamond-quilted backrest. Simple curves and a modern silhouette give this stately chair a unique look. A diamond-quilted and arched backrest only enhances its chic allure. In order to offer a seating experience of utmost comfort, the backrest is specially designed to hug the body. The Hertz dining chair is also padded for additional comfort. 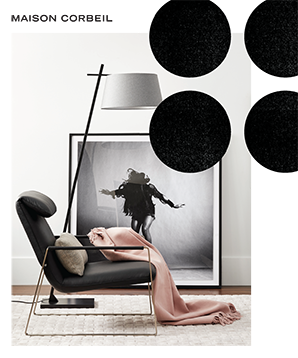 This urban-chic dining chair is offered in black imitation leather or two shades of velvet. The Hertz dining chair sits atop sleek black metal legs for a refined and contemporary aesthetic. - Padded backrest with diamond quilting. - Choice of velvet or imitation leather upholstery.